Similar to adding custom fields to tickets, you can add custom fields to organizations to store additional details. Any custom org fields you create apply to all organizations. Administrators can create and edit custom fields for organizations. Custom org fields are visible to agents, but not end-users. Custom user and organization fields are not available on the Essential plan. Note: Enterprise agents might be also able to create and edit custom fields for organizations, depending on their permissions. You can use custom org fields in your triggers and automations (see Leveraging user and org fields with business rules ). 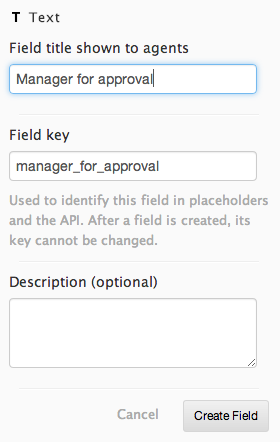 You can use placeholders to reference custom org fields in macros, ticket comments, and notification messages (see Placeholders for custom fields ). Custom org fields are searchable (see Searching custom user and organization fields ). Professional and Enterprise customers can report on custom org fields in Insights. For details, see Reporting on custom fields in Insights . Note: You can also add custom fields to users (see Adding custom fields to users ) and tickets (see Adding custom ticket fields ). Note: Enterprise agents might be also able to create and edit custom fields for organizations, depending on their permissions. For information about permissions for Enterprise accounts, see Custom agent roles . Tip: Be sure to check out these user and organizational fields recipes in our Support Workflows Cookbook : Software support , Internal IT , and Retail business . Also, for more custom organization field recipes, see our Customer-centric cookbook . Share your recipes ! Click the Admin icon ( ) in the sidebar, then select Organization Fields . The order of your active custom fields here is the same order they will appear in each organization profile. You cannot change the field key after you create the custom org field. The field key is used by the API and Liquid placeholders, and it is the only field setting that is not editable after it is set. New organization fields are active by default and are added to all organizations. You can manage your custom organization fields in the Organization Fields admin page. In the Organization Fields admin page, click the name of the custom org field you want to edit. In the Organization Fields admin page, click the name of the custom org field you want to delete. When you delete a custom organization field, that field and any associated data is removed from all organizations. The data is preserved only if the custom field also adds a tag to the organization. The two custom fields that add tags are the drop-down list and the checkbox. If you delete one of these custom fields, then the data in organizations persist as tags. Click OK to confirm that you want to delete the custom organization field. The custom org field and any associated data is removed from all organizations. In the Organization Fields admin page, hover over the custom org field you want to activate or deactivate, then select Activate or Deactivate . In the Organization Fields admin page, hover over the custom org field you want to clone, then select Clone . A duplicate organization field is created, and the properties panel opens on the right so that you can edit the settings. I added custom organizational fields however I do not want my agents to have the ability to change the data in those fields. Is there a way to lock custom fields to prevent accidental changes made? I did some testing and the custom organization fields are only visible to your agents but they are not editable. Only admins can create and edit them. However, if you are on the Enterprise plan, depending on the permissions set on your agents' role, they can also edit and create these organization fields. You can find more information on Custom agent roles here. Hope this helps! Please let me know if you have other questions. Is there a way to change the order of these fields once they are established? Hi Casey, you can just click and drag them up and down the list. Hi. I have set some Organization and User fields as a drop box, and installed the User Data App, but the information shown on tickets are the tags, and not the Title. Is there a way to show also the Titles? Regretfully there's not a way to edit the type of organization field once it's been created; you would need to create and add a new organization field. Can I define a default value for a create organization field? to be set by default for any new organization. I'm not sure I understand your question; could you give an example of what you're trying to do? Sure, e.g. SLA dropdown - to be set to Basic by default, when a new org is created. Then changed manually to Silver or Gold as relevant. Hey Yael, sorry for the delayed response. Do you want this field in a ticket or in the Organization profile? Organization fields are subject to business rules like Triggers or Automations, so all your Org fields will default to "-" when the Org is created. You'll need to set each of them manually at the time the Org is created. Can custom fields be used as a primary key? My use case would have the client's unique identifier as the PK in custom_field.ID, this would never change. Right now, we're using the name field to house ClientName / ID (e.g. Frank's Taxidermy / 12345). There are occasions where Frank will change his business to Frank's Tree Service and right now, my imports are creating a new organization record, rather than appending the existing record. Take a look and please post back on your findings! I'm on the Team Plan and, as a new user, really enjoying the experience thus far. Can I ask why it is that you offer multi-select field definition for tickets but not for organisations [no 'z's for me as I'm from the UK] please? I have a requirement to define an organisation with a field where I can multi-select from a set of our products to indicate what they're using. Why is this not offered on organisations (or indeed on the user fields) when it is available for a ticket field. Seems odd given the functionality is plainly there. Are you planning to offer this custom field type to organisations and users in the near future. If not can I request for these to be provided as my current alternative is to simply list this out in a delineated text field. Nasty! Is there any way to add a custom field that can display a clickable URL? Circling back. I ran an import that added an external ID for my organizations. Now when I import organizations, the name changes as part of the import, NO MORE MANUAL ORGANIZATION UPDATES!!!!!! !